No matter who you are it is impossible to escape from your fears. A lot of times we are programmed from a young age by our parents, our education system, and society to carry a certain set of beliefs or perspectives of the world. We grow up and are taught to fear almost everything. We are afraid of the unknown, of the dark, to be alone, to be left out2 of the group, to express ourselves, to make mistakes, to fail, to lose things, to be vulnerable3 , and to speak our truth4. Our fear may even hold us back from following our bliss, truly living our best life, and quite often, living our English. The situations that your mind imagines build up5 into “personal dragons.” These personal dragons are a metaphor6 for the big fears or “internal demons” within that are holding you back from your true potential as an English learner. Instead of running away from your English fears, you can choose to make your fear your friend and learn how to slay7 the dragons that come up along your journey to RealLife English fluency. You may have allowed the fear of speaking English in public, to make a mistake, or to be excluded from the group, hold you back from reaching your full potential. Guess what? You don’t have to continue along that path anymore. Every day is a new opportunity to confront8 your fears and start living your English! It’s as simple as finding ways to step outside of your comfort zone and to slay the dragons present in your life. There are a number of reasons WHY you should step out of your English comfort zone every day and face your fears. 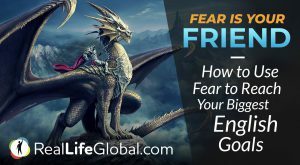 In this article, we’ll focus on HOW you can make fear your friend in order to build the courage to slay your personal dragons and achieve your biggest English goals along the journey to RealLife English fluency. Although it won’t be an easy feat9, if you are up for the challenge, you will discover endless rewards throughout the quest10. Today is the day to start facing your fears, slaying your personal dragons, and taking your English to the next level. Are you ready to accept the call to adventure? Before you dive straight into to conquering your biggest English fears, it is smart to take a little time to create a plan that will help you slay your dragons. One extremely effective way to start tackling your fears11 is by using an exercise called Fear Setting that was originally created by the self development podcast legend, Tim Ferriss (host of the Tim Ferriss Show). In his TED Talk, Why you should define your fears instead of your goals, Tim Ferriss shares how stoicism12 and his Fear Setting exercise has helped him face his fears and make difficult decisions in life. Though this exercise was designed to help you face any fear that is present in your life, you can use it to face the fears that you encounter as an English learner. This helps you understand your fears and create a plan to overcome them. In order to complete the exercise, you just need to have a pen, paper, and about an hour of free time to brainstorm13 your thoughts and ideas. Here’s how it works. Give yourself a few minutes to write down everything that comes to your mind as you answer the following questions. What are your biggest English fears ? What is the absolute worst thing that could happen if you decided to face them? What steps could you take to repair/fix any potential damage? Usually it doesn’t require too much effort to fix. What are the potential benefits of facing your fear? What are you putting off14 out of fear? Usually we most fear the things that we know we really should be doing. What is it costing you to put it off? Where will you be in six months, one year, and three years? Start doing and saying the things that you usually avoid. Once you understand that your fears are just creations of your mind, it’s time to schedule time in your week to take yourself out on a fear date. This step is as simple as it sounds, yet very difficult to practice consistently. A fear date is just like a normal date that you would schedule with a lover, boyfriend, girlfriend, husband, or wife, but instead of a fancy dinner or afternoon in the park, you do something that absolutely scares you in English. It should push you way outside of your comfort zone. Internally, you should be screaming for help just thinking about the activity. This is something that you would usually avoid because of fear, but know will help you advance your English abilities. For example, if you are afraid to speak English in public, you could schedule to give a presentation at an event, host your own workshop, or attend a language exchange event. If you are afraid of cameras, record a video of yourself speaking English and share it with a group of friends that are also learning English and can give you feedback on your mistakes. This is an important part of the Fluency Circle global community, a group composed of students from our premium courses. If you avoid writing or reading in English, schedule time every morning or night to learn something new by reading books or blogs, and then reflecting on what you learned in a journal. In order to grow as an English learner, you have to be willing to put yourself into uncomfortable situations on a regular basis. It’s only once you’ve reached the edge of your comfort zone when you truly begin to grow. It’s not easy to wake up and be immediately prepared to face your biggest fears. For that reason, it is important to build momentum17 every morning by “slaying the dragon” to start the day. In this case, “slaying the dragon” is an exercise that involves doing something that is mildly uncomfortable, yet will help you ignite your mind in English every morning. Not only will it get you thinking in English, but it will also fuel it for the bigger dragons that you will face during your fear dates throughout the day. You could start off the day by doing a guided meditation in English, writing down three things you are grateful for in your journal, singing a song in the shower or while making breakfast, reading a few pages out loud, creating a video about an experience you had, or listening to a TED talk. These are all great options to “slay the dragon” and get your mind thinking in English every morning. If you want to conquer your biggest English fears, it is essential to create a daily habit of doing things that scare you and make you feel uncomfortable. By making these habits a natural part of your day, in no time you will be able to turn fear into your best friend, unlock your true potential, and become a real dragon slayer. As you begin to take on your fears and challenges on a daily basis, you will build the courage and confidence to take on bigger dragons in different areas of your life, not just English. It all starts with making the decision to step outside of your comfort zone and into your greatness. So…what are you waiting for? Take the leap and commit to living your English! Are you ready to accept your call to adventure and conquer English? Today is the day to take your English to the next level! You are doing an excellent job!!! God bless you.. Thanks so much.